Prototype: Three different Belgian State Railways (SNCB/NMBS) type Shimmns four-axle telescoping cover cars. Brown basic paint scheme. Model: All of the cars have fixed end walls and three sliding telescoping covers. The interior of each car has 5 load cradles with movable restraint arms. 3 coils are included in each car. The trucks are Y 25 design. All of the cars have different car numbers and each car is individually packaged. There is also a master package. Length over the buffers per car about 13.8 cm / 5-7/16". DC wheel set E700580. 3 coils included in each car as a load. 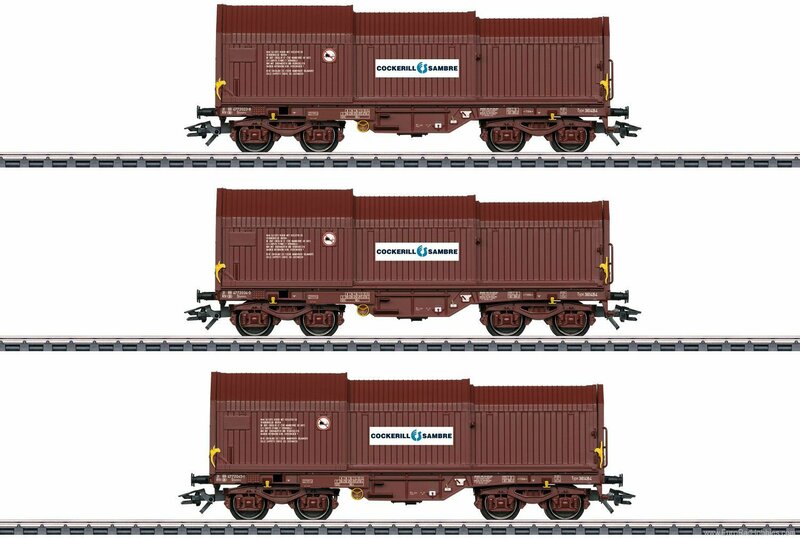 A diesel locomotive to go with this car set can be found in the Märklin H0 assortment under item number 37277.